Refrigerator freezing food? I opened my refrigerator and the milk and food is partially frozen. My water bottles are almost ice! It feels extra cold in the refrigerator area but the freezer seems to be working fine. Last night before I went to bed everything in my fridge was cold but not frozen. If the food and liquids in the fridge are freezing, what would make my refrigerator all of a sudden start to freeze all the items in it? Is my refrigerator broken? Please Help! Quick Answer: If your refrigerator is “all of a sudden” freezing your food and drinks, the temperature setting for the fridge has been inadvertently set TOO LOW or TOO COLD. Try setting the refrigerator section temp to medium or the number 5. If your refrigerator lets you set the exact temperature, set it to 40 °F or a little below. This can happen on freezer-on-the-bottom refrigerators too where food in the fridge’s crisper drawer “all of a sudden” freeze. Set the temp to 40F in fridge section and 0F in the freezer section. NOTE: On some fridge/freezers, the temp control in the freezer sets the coldness for the refrigerator section too. 1 – The temperature for the refrigerator has been set TOO LOW or Set warmer. Most common reason. 2 – If the coils on your fridge are dirty or dusty, then the compressor needs to work harder and longer to keep the freezer temperature at freezing temperature. When this happens, on some refrigerator models, the refrigerator can over cool and freeze food and drinks. 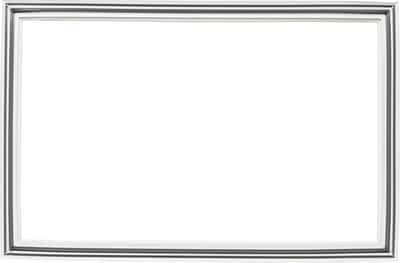 3 – There is a gasket on your freezer door. Make sure it is sealed/sealing correctly. If the freezer door is not sealing properly, the freezer will run continuously and cause the fridge section to get too freeze. 4 – Newer refrigerators have an air duct that is adjustable. Usually it is positioned where the milk is supposed to be to keep it colder than the rest of the refrigerator. To avoid this problem in the future, buy a simple inexpensive fridge thermometer. 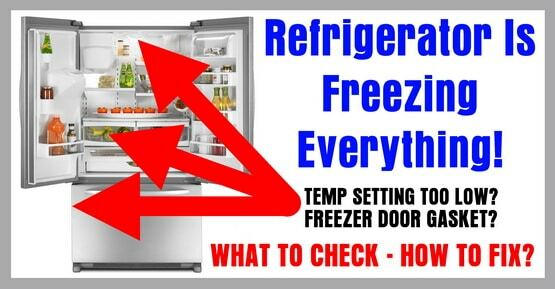 Not only will you always know the exact temp in the fridge, but if the temp ever rises or lowers, you will know the temp setting has been inadvertently changed and needs to be adjusted. If someone changed the temp in the fridge by accident, next time it may get changed the opposite direction and the temperature in the fridge could rise (get warmer). You need to watch the fridge temp to be sure it never gets too high. If the temp in the fridge rises (gets warmer), your risk for foodborne illness can rise also. So pay attention to the fridge and freezer temperatures. To be sure your fridge is always working as designed, keep the temperature at 40 degrees fahrenheit or a little below. Many older refrigerators do not show the actual temperature in the freezer or fridge sections. Using an appliance thermometer will let you monitor the temp and re-adjust the temp of the refrigerator or freezer if needed. If your refrigerator does not have an actual temp display, use an inexpensive thermometer in the fridge and the freezer. If your food, drinks and everything in your refrigerator is frozen or partially frozen and you need help, please leave your issue below and we will be happy to help. I have an older GE fridge that I shipped overseas. My problem is that the upper part of the fridge keeps freezing up with a build up. I have replaced the defrost timer, fan and a glass tube in the freezer below the coils. The fridge is ok for a week or so, sometimes longer and then the problem starts all over again. I’ve had a repair person come to fix it and replace the above pieces 4 times. I am hoping that perhaps you have had this problem before and might be able to suggest what piece I need to replace to finally repair this problem. 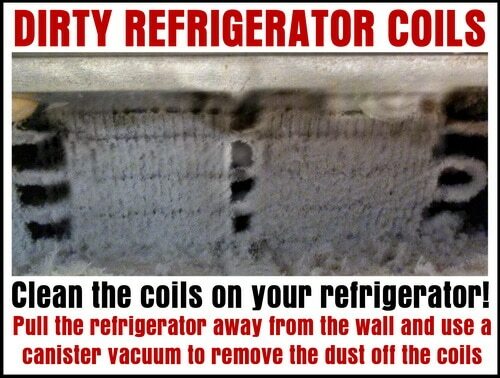 When they open the freezer the coils have also had ice build-up. My garage fridge suddenly started freezing everything in the refrigerator side. Freezer is fine. I recently had a water issue where the wall it’s plugged into was filled with water. Could this be the reason this is happening, or is it unrelated? Have any of the below commenters even read what is above? Fixing any issues with your thermometer or pulling the vaccuum out and vaccuming the coils behind or under the fridge will take care of the problem in most cases. My Samsung fridge controls started blinking and then all the food in the fridge started freezing. I can’t seem to find the problem. My refrigerator freezes everything I put in it. It is set at the lowest possible temp. I have had the repairman here 5 times. He has changed four parts and it is still freezing everything. lg refrigerator lmx25964st freezes everything in refrigerator section,and no water output on door. My fridge keeps freezing my food. I cleaned freezer out and made sure vents weren’t blocked worked for a week now it’s doing it again. I put raw meat in fridge to thaw for a whole day. So why is it frozen? I don’t know what I’m supposed to do. I’m scared to take it out the fridge in case of bacteria but feel it is never going to thaw if I don’t take the meat out and put it on the work top. I would appreciate some advice on this please. Thank you. Went away for two days; during my absence refrigerator door was slightly open. Upon my return, fridge had most likely been running constantly to keep temp at 40 degrees. After closing the fridge door tightly, fridge then dropped temp to 20 degrees, where it has remained. Temp setting is at 5 (midpoint) where has been for 6 years. Help! Everything in fridge is freezing! Frig keeps freezin things.Food and liquid.Frig set at 42 and freezer at 2.Still freezing.